With firm commitment to quality, we are manufacturing and supplying a comprehensive range of tiny compression springs. these products find a wide application is varied industries. We make use of suitable technologies and premium quality raw material to manufacture these products. 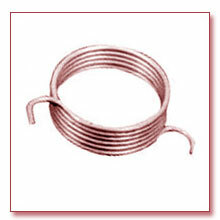 We offer our range of springs in numerous formats, which can be availed by the customers at most affordable prices. Star Springs Co. and Diamond Springs are the trusted name in the field of Helical springs with an experience of over-40 years. Our facilities have been developed to manufacture springs for virtually any function from tiny springs used in thermal fuses and micro switches to heavy springs used in crushes, elevators and actuators.